Google Maps field Configuration Interface. Home : Defines what type of parameters will be used in the API. Display Mode : Indicates the display of the map. It can be opened in a Modal or in a new Window. Width : Defines the width of the map that is going to be displayed. Height : Defines the height of the map that is going to be displayed. Zoom : Defines the initial Zoom (available from the Google API) of the Map location. The API Key is a unique key, composed by a string(text) alphanumeric, which is the license to use the service. When you subscribe to use the service, the key is tied to the domain and the directory of the server. All the pages that use the API needs to be in the same directory that was used for the subscription. In case you have a web server on your local machine, you just need to possess a key for testing, and to do this you only need to place http://localhost in the domain of the subscription. Link Type : Defines how the link will be displayed. Disabled Field : Defines if the field will be disabled in “Insert Mode”, “Update Mode” or in “Insert and Update Mode”. 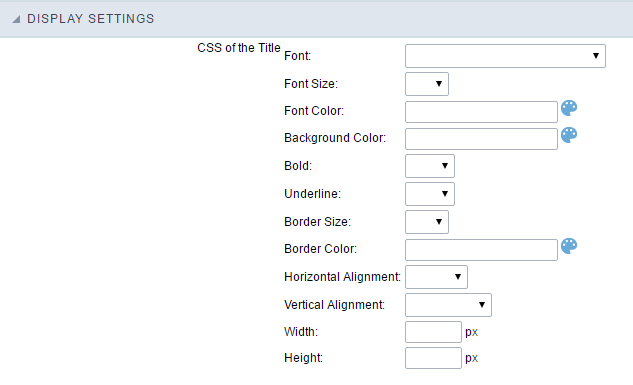 The Display Settings allows to deifne the CSS for the fields individually. 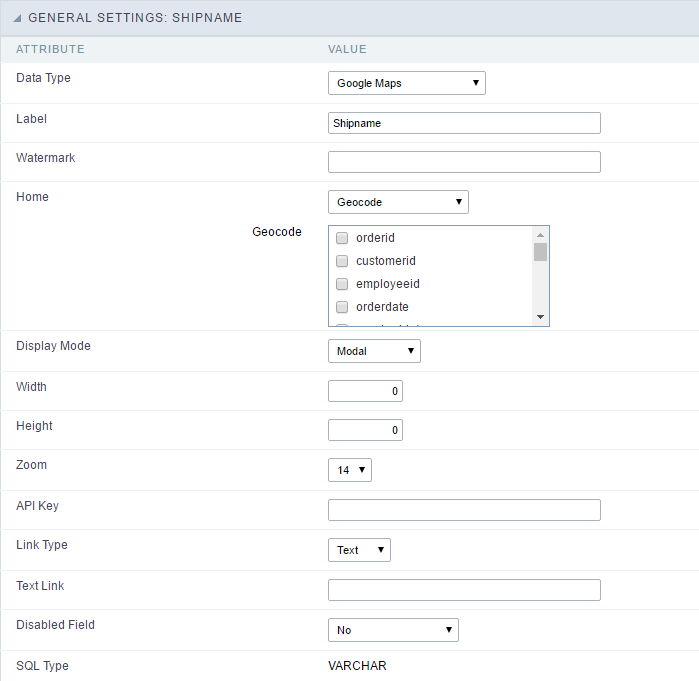 For each Display Settings of Scriptcase, exists the same attributes available for this interface. Font : Allows to choose the font type, that will be applied to the application field title. Font Size : Allows to choose the the font size, that will be applied to the application field title. Font Color :Allows to choose a color for the font from the color pallete. Background Color : Allows to define the color for the field, the color can be seleted from the color pallete. Bold : Applies the bold style to the font. Underline : Applies the underline style to the font. Border Size : Applies the border size to the title of the field. Border Color : Allows to choose a color for the border, using a color pallete to apply to the title. Horizontal Alignment : Allows to position the label of the field in the desired position (left,rigth,center and justify). Vertical Alignment : Allows to position the label of the field in the desired position (baseline, sub, super, top, text-top, middle, bottom, text-bottom). Width : To define a width for the title of the field. Height : To define a height for the title of the field. Font : Allows to choose the font type, that will be applied to the application field. Font Size : Allows to choose the the font size, that will be applied to the application field. Border Size : Applies the border size to the field. Border Color : Allows to choose a color for the border, using a color pallete to apply to the field. Horizontal Alignment : Allows to position the field in the desired position (left,rigth,center and justify). Vertical Alignment : Allows to position the field in the desired position (baseline, sub, super, top, text-top, middle, bottom, text-bottom). Width : To define a width for the field. Height : To define a height for the field. Background Color : Allows to define the color for the Input Object, the color can be seleted from the color pallete. Border Size : Applies the border size to the Input Object. Border Color : Allows to choose a color for the border, using a color pallete to apply to the Input Object. Horizontal Alignment : Allows to position the Input Object in the desired position (left,rigth,center and justify). Vertical Alignment : Allows to position the Input Object in the desired position (baseline, sub, super, top, text-top, middle, bottom, text-bottom). Width : To define a width for the Input Object. Height : To define a height for the Input Object. Allow the developer to set up instructions and hints about the field’s use, allowing the developer to help the users about the system usage. Description of the settings attributes. In this area, you can set up a text that will be shown in the application according to the type of help selected below. Pop-up - Display a default icon ! beside the field. To display the message just click in the icon that a Pop-up will be displayed with the help text. Hint - Display a default icon ! beside the field. When the mouse is above the icon a help text will be displayed. The icon displayed when selecting the types Hint or Popup vary according to the theme that is being used in the application. This icon can be modified in the CSS Buttons. Text - Display a text inside of a <span></span> beside the field. Beside: The help icon will be displayed beside the field. Column: The help icon will be displayed beside the label of the field.